CRAFT is designed to be used in a team environment. 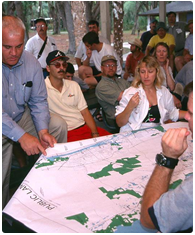 While CRAFT ultimately assists forest managers, the team environment aspect allows concerned stakeholders, groups or individuals to be included in the project and decision making process. This process brings together a diverse group of people and ideas. Because some problems are more complex than others and users have various levels of experience, teams are able to move through various stages at different paces and levels of detail. CRAFT is designed to be user-friendly, where teams should explore these web pages and decide how CRAFT might be useful for their project. 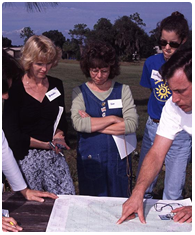 A more effective approach is to have a team facilitator that is familiar with CRAFT and knowledgeable about the risk assessment techniques used here. Please contact us for information about how to receive training or assistance in using CRAFT.